Our team have been designing websites for B&Bs since 1996 and have seen many technological changes in the functionality of the Internet and the devices used to access it. A properly functional website is essential to provide guests with information and the ability to book directly. If some 'lands' on your website question why you would divert that to another site to process the booking at further cost to you. 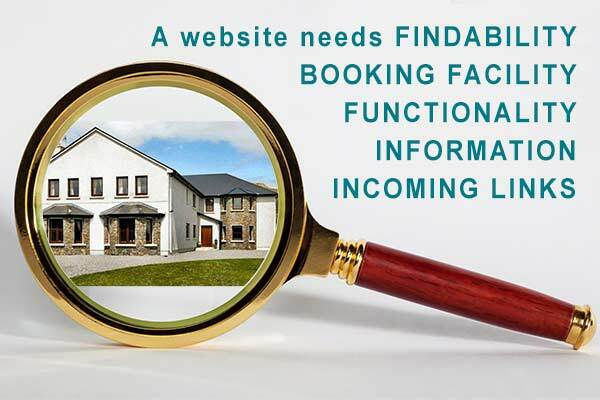 We understand findability and how to optimise your profit from Internet bookings, and do it at the lowest cost. As an advertiser, your website is included in our directories, portals and regional websites - this provides all important incoming links to your website - just one element in Search Engine Optimisation (SEO) that is not freely available elsewhere. We can update old websites that don't render well on mobile devices. We can design plain or ornate websites but would recommend simpler designs that work well on mobile phones or tablets.